Nowadays the surface waters in Krasnoyarsk krai suffer from increased levels of phenols, petroleum products and metal compounds (iron, copper, manganese and rarely cobalt and nickel) due to anthropogenic activities. The threshold limit value of those substances is often exceeded by 40-80 %. It is regularly observed in Yenisey, Chulym, Angara, Kan, Podkamennaya Tunguska and Nizhnyaya Tunguska rivers. "The new adsorbent is based on raw materials derived from Siberian Larch (Larix sibirica). The chemical modification of natural matrix allows us to produce a water-soluble material (sulfated arabinogalactan) for creating polyelectrolyte complex that cleanses the pollutants and helps the disposal of wood processing industry products. 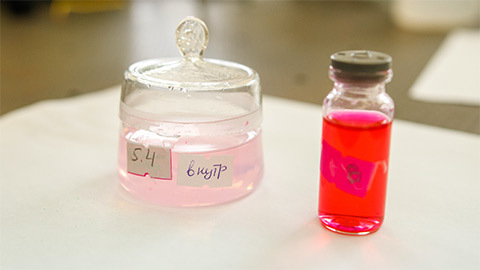 In addition to raw materials of vegetable origin the biosorbent will also include a component of animal origin — chitosan" Head of the Project, Professor at Specialized Department of Photonics and Laser Technologies at SibFU School of Engineering Physics and Radio Electronics, Evgenia Slyusareva explained. It is believed that the new development will not only prove its efficiency towards heavy metal ions, but also towards organic coloring agents, prototypes of aromatic pollutants with heavy atoms in their structure and functional groups type variation. The new material can be efficiently used in sewage treatment filters and can be recommended for major production facilities use.